We will be traveling to Maysville, KY 2019 to join the Kentucky Gateway Museum Gala Event on April 30 and May 1, 2019. The Kathleen Savage Browning Miniatures Collection is amazing. The skill of the artists from around the world who helped create this collection is quite a tribute to their craftsmanship. We will have our booth setup for 2 days scanning people and pets in 3D. Paris Renfro (6-inches tall in this photo) is posing next to his die-cast Bugatti Chiron. Create your own custom scaled doll with a pose which compliments your room box or vignette. Imagine a full color sculpture of you or your family inside your room box, dollhouse or vignette. You strike the pose which compliments your room. You can be holding your cat or admiring artwork. Whatever works best for your room. Holodeck 3D Studios creates life-like miniature 3D sculptures (aka dolls, figurines or mini-me) of real people. The sculpture is custom scaled. We love doing personalized models! Sharon and Rose taking a walk in the park. Note: Rose is 5.58 inches tall and won 2nd place at the county fair! Not only do our 3D custom scaled dolls look good in miniature rooms - they make great "Flat Stanleys!" Take them on your next vacation and turn them into travel gnomes. 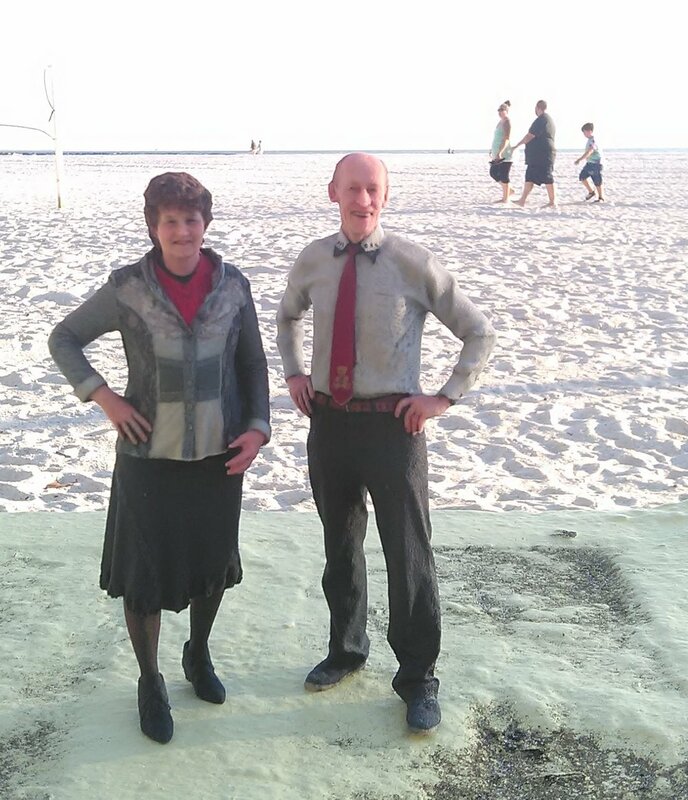 Hans and his wife are about 6-inches tall posing at a Florida beach! Susan Cone's mini me has definitely been noticed. She told us: "My mini me has found a home. No one notices my work. They only want to know how I made a mini me." Catherine Guilloux is chez la vieille anglaise (in the old English room) admiring her handiwork. Bethina Murta "selling" her desserts. Originally from Brazil, Betinha Murta started making miniatures in 2004, Betinha now lives in Orlando, FL. She first started making teapots, and now has a wide range of products made from cold porcelain, molded by hand. To see more of her handiwork visit her blog by clicking on either picture. Pat Bennett's sculpture was the last to arrive to complete this room. Pat gutted a mantle clock and created a cozy sitting room. How clever! Pat Bennett is the owner and promoter of the www.portlandminiatureshow.com/, the www.seattleminiatureshow.com/, and the www.portlandminifleamarket.com/. Parked to perfection! We met Paris Renfroe, of PRD Miniatures at CIMTA. We were impressed with his work. His "garage" is filled with Diecast cars replicas of Ferraris, Lamborghinis, McLarens, Bentley, and some sport bikes. Notice he is even wearing a miniature helmet! Diane Wendt's mini-me went country style in her miniature barn! She makes it seem so realistic with her miniature animals, barn loft, and country accessories. Jeany Dean created two whole miniature bedrooms! Check out the super cute little girls room with tiny toys. 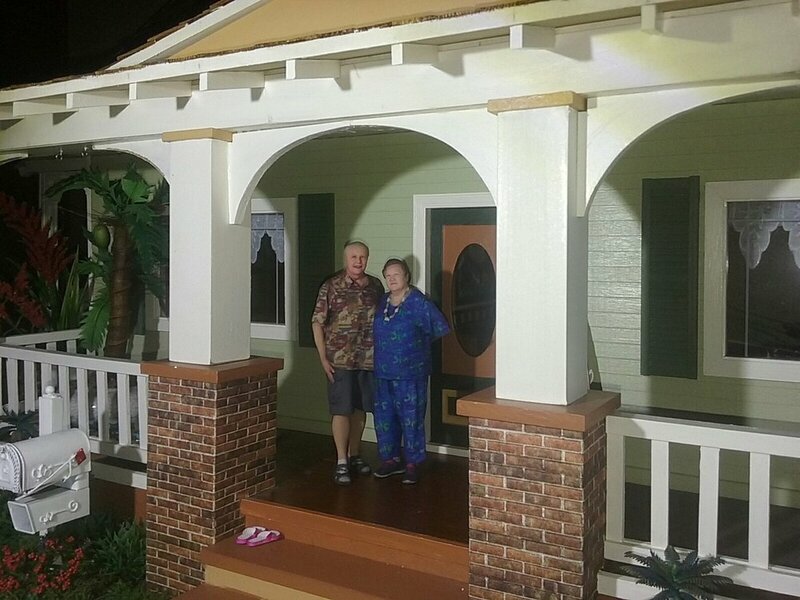 Here is Vern and Jeannie inside their 1'' scaled gazebo! Jeannie made this beautiful gazebo and surrounding flowers. Vern added the final touch by secretly ordering a sculpture of the two of them. He then placed it in the gazebo as a birthday surprise for Jeannie. How sweet is that?! The next four room boxes were created by Kylie Bygland. The first room box she calls "Arabian Nights." Although, this room is really modeled after Medina Azahara in Cordoba Spain. Kylie filled it with hookahs, cushions and a monkey stealing grapes! You can see Kylie in the back of this room admiring the view. The next photo is a cozy den. This is where she imagined her husband relaxing in. 1900's Kitchen: The circa 1900’s kitchen was Kylie's first attempt at a miniature room box. She had lots of fun learning what to do. 3-inch Vicki enjoying a day of window shopping in her miniature town. Patisserie: Kylie loves sculpting in polymer clay (See her Venetian masks ) so it was easy for her to use this room box as a bakery. She made most of the bakery items on display. She decided her husband should be in the bakery deciding what he would like to buy. Meet Gael! She is custom scaled for each of her lovely rooms! Say Aloha to Kathy and Darrel Hall! 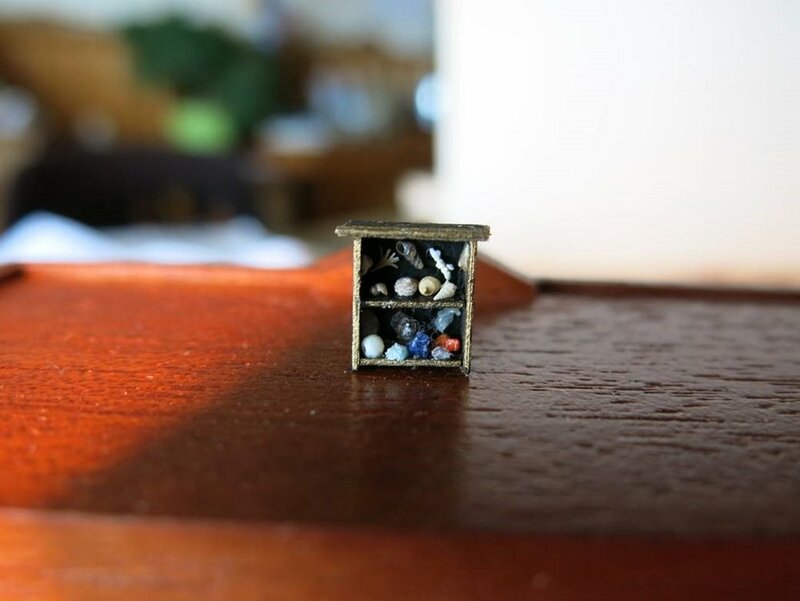 Their amazing miniature houses will be featured in a miniature magazine shortly. Keep an eye out for them! Welcome to Gay and Roy Crawford’s miniature home (in Saratoga, CA). By the way – their darling miniature home is on the market. 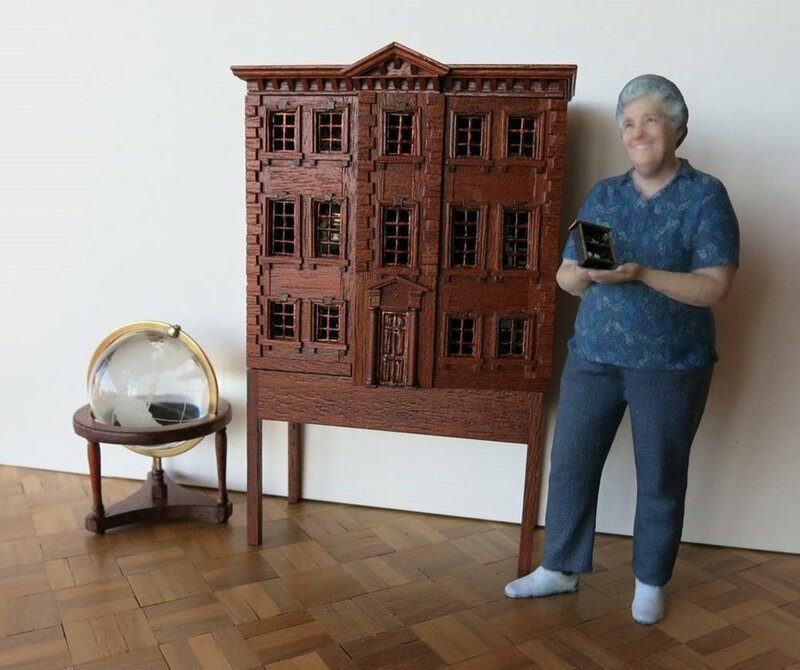 If you are looking to add another dollhouse to your collection, please email dawn@holodeck3dstudios.com and I will put you in touch with Gay and Roy. When we first saw the picture of Betsey Reno standing in front of her "favorite things cabinet", we were fooled into thinking it was really her. The cabinet was created by Bobbie Johnson. Betsey Reno looks great in this bedroom. Dressing in a costume really helps make this look real! Betsey got these cute items of furniture in Philly. The cabinet of curiosities “I” am holding!! Kay is 5.8-inches tall in these photos. OMG! I just got your package and the doll looks wonderful in front of my dollhouse! Why didn’t I get one the first time I saw your Holodeck system! I need to get one of David the next time we visit! And then the kids, Marlene, Bob....probably everyone I know! Thanks so much for knowing that I wanted one, even when I didn’t know myself!